The global market for pain management therapeutics is anticipated to rise at a steady pace in the upcoming years on the back of improving healthcare infrastructure, increasing economic stability globally, and increasing penetration of established players in emerging economies that are brimming with growth opportunities. Besides this, growing geriatric population globally, changing lifestyles, and high prevalence of chronic pain are acting in favor of the market’s growth. As per statistics of the National Health Interview Survey, in 2016, almost 20% of the world’s population was reported to be suffering from chronic pain. As per a report by Transparency Market Research (TMR), the global market for pain management therapeutics is likely to clock a CAGR of 4.0% for the forecast period from 2017 to 2025. Progressing at this rate, the market’s valuation of US$62,246.8 mn in 2016 will become worth US$88,253.4 mn by the end of 2025. The report studies the pain management therapeutics market based on a few parameters, viz. indication, therapeutics, and geography. By therapeutics, anticonvulsants, antidepressants, anesthetics, opioids, non-steroidal anti-inflammatory drugs (NSAIDS), antimigraine agents, and other non-narcotic analgesics are the segments into which the pain management therapeutics market is segmented in this report. Of them, opioids and NSAIDS account for leading revenue contribution to the overall market. In 2016, NSAIDS and opioids held almost 22% and 26.7% share respectively in the overall market. Increasing prescription of opioids for pain management is one of the key growth drivers of this segment; the opioids segment is likely to exhibit a CAGR of 4.4% from 2017 to 2025. On the other hand, other non-narcotic analgesics is likely to emerge as a lucrative segment during the forecast period. Based on disease indication, the pain management therapeutics market has been categorized into neuropathic pain, arthritic pain, fibromyalgia, chronic back pain, migraine, cancer pain, and post-operative pain. The cancer pain management segment is likely to lead the market vis-à-vis revenue over the report’s forecast period. The growth of this segment is attributed to increasing prevalence of cancer along with rising awareness for cancer pain therapeutics. As per a report published by International Association of Study Pain, over 10 million individuals globally are diagnosed with cancer every year. However, the segment of chronic back pain is likely to surpass in terms of growth rate; the segment is likely to exhibit a CAGR of 4.3% during the forecast period from 2017 to 2025. This is mainly because of rising incidence of lower back pain problems among individuals with long desk jobs and increasing incidence of other chronic conditions. Geography-wise, the global pain management therapeutics market has been classified into North America, Asia Pacific, Europe, and Rest of the World. Of them, North America held the leading share of 56.1% in the pain management therapeutics market in 2016. The growth of this regional market is mainly because of favorable reimbursement policies for prescription drugs used for pain management and availability of a spectrum of over-the-counter drugs for pain management in the U.S., and Canada. Powered by the U.S., the North America pain management therapeutics market will likely display a CAGR of 4.1% during the forecast period from 2017 to 2025. Europe stood second holding 25.9% of the overall market in terms of revenue in 2016. Asia Pacific, on the other hand, is anticipated to witness the leading growth rate of 4.6% from 2017 to 2025 due to a growing geriatric population, rising awareness to address health problems in a timely manner, and increased focus of leading companies to tap into growth opportunities in China and India. Prominent names in the global pain management therapeutics market include Abbott Laboratories, AstraZenecal plc, Mallinckrodt plc, Eli Lilly & Company, GlaxoSmithKline plc, Endo Health Solutions, Novartis AG, Purdue Pharma LP, Merck & Co. Inc., Pfizer Inc., Johnson & Johnson, and Teva Pharmaceuticals. This report on the pain management therapeutics market studies the current as well as future prospects of the market globally. The pain management therapeutics market report comprises an elaborate executive summary along with a market snapshot providing overall information of various segments and sub-segments considered in the scope of the study. This section also provides the general information and data analysis of the global pain management therapeutics market with respect to the leading market segments based on major therapeutics, and geographies. The market overview section of the report explores the dynamics such as drivers, restraints, and opportunities that currently have a strong impact on the pain management therapeutics market and could influence the market in the near future. Market attractiveness analysis has been provided in the overview section in order to explain the intensity of competition across different geographies. The competitive scenario among different players is evaluated through market share analysis in the competitive landscape section of the report. All these factors would help market players to take strategic decisions in order to strengthen their position and expand their shares in the global pain management therapeutics market. The global pain management therapeutics market has been studied based on major segments by therapeutics, by indication and their regional as well as national markets. Based on therapeutics, the global market has been segmented into anticonvulsants, antidepressants, anesthetics, non-steroidal anti-inflammatory drugs (NSAIDS), opioids, other non-narcotic analgesic, and antimigraine agents. Further the market has been segmented according to its indication that includes neuropathic pain, fibromyalgia, arthritic pain, chronic back pain, migraine, post-operative pain, and cancer pain. The market for these segments has been extensively analyzed based on their effectiveness, sales, and geographic presence. Market revenue in terms of US$ Mn for the period from 2015-2025 along with the compound annual growth rate (CAGR %) from 2017 to 2025 are provided for all segments, considering 2016 as the base year. Geographically, the pain management therapeutics market has been segmented into four regions: North America, Europe, Asia Pacific, and Rest of the World (RoW). 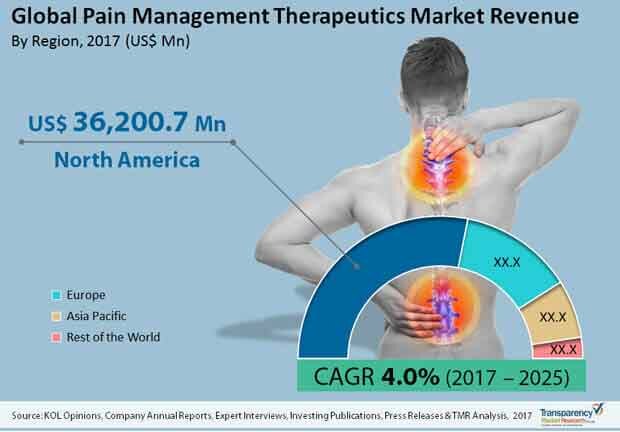 Each regional pain management therapeutics market has been further categorized into major national markets such as the U.S, Canada, Germany, the U.K., Japan, China, Brazil, and Mexico. Market revenue in terms of US$ Mn for the period from 2015-2025 along with CAGR % from 2017 to 2025 are provided for all the regions and nations considering 2016 as the base year. The competition landscape section included in the report would assist existing market players to expand their market shares, and new companies in establishing their presence in the global pain management therapeutics market. The report also profiles key players operating in this market based on various attributes such as company overview, financial overview, business strategies, product portfolio, and recent developments. Major players profiled in this report include Pfizer Inc., Depomed, Inc., Endo International plc. , Purdue Pharma L.P., Mallinckrodt Pharmaceuticals, Teva Pharmaceutical Industries Ltd., Novartis AG, AstraZeneca plc., Johnson & Johnson Services, Inc., Merck & Co., Inc., Abbott Laboratories, GlaxoSmithKline plc., and other prominent players.